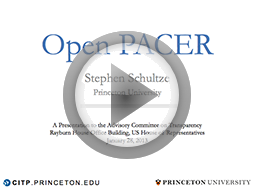 The Open PACER Act provides for free and open access to electronic federal court records. The courts currently offer an expensive and difficult-to-use web site. They charge more than their cost of offering the service—more than Congress has authorized—violating the E-Government Act of 2002. This Act seeks to, once and for all, compel the courts to fulfill Congress' longstanding vision of making this information "freely available to the greatest extent possible". Why can't Americans look up their own case-law for free? PACER was designed before the turn of the century, and hasn't been updated much. It is difficult to search, confusing to use, and is not indexed by search engines like Google. The biggest problem is that it charges for access. Every time you search, view a docket report, or download a document, you pay. These little charges add up quickly and make it impossible to do large-scale searching or analysis. This is bad for democracy. The Open PACER bill is being developed with active feedback from anyone who wishes to comment. Beside each paragraph, you will see a blue comment bubble. Click, and you can add your own remarks or suggestions. Usually the only people who are allowed to do this are members of Congress or lobbyists, but with this bill you are in charge. This is an approach that was first taken by open-internet champion Representative Darrel Issa. You can even edit the bill yourself. It is written in Legislative XML, the exact same format that legislators use to draft a bill. 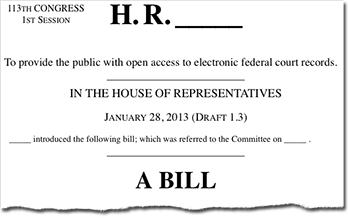 The "source code" of the bill is managed through a tool called github, which is popular with open-source computer programmers. Open PACER takes this spirit to the legislative drafting process. You can view the source code, create your own version ("fork") of the bill, and submit proposed changes ("patches").